Before the modern 4WD safari became so popular – and, in fact, before arrival of cars in general – the only way to experience the African bush was on foot. The most famous African explorers of the 19th Century, the likes of Burton, David Livingstone and Henry Morton Stanley, and even Ernest Hemmingway in the early 20th Century, would all have discovered Africa on a walking safari of sorts. Expeditions were typically fraught with drama and danger in equal measure, a far cry from today's safari experience. 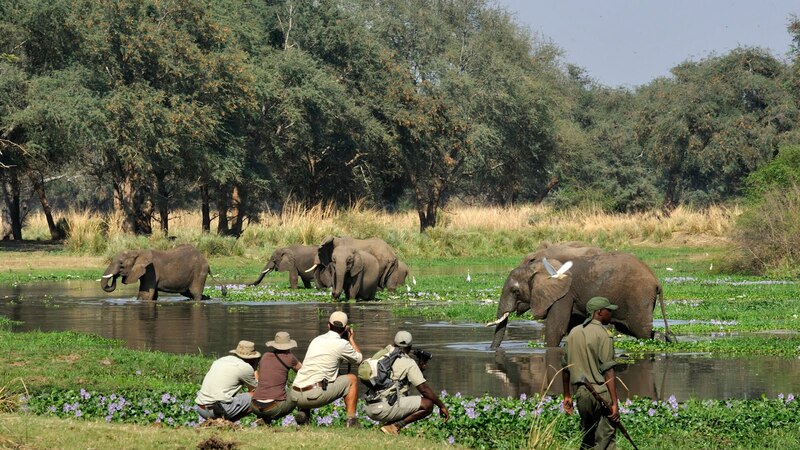 In the 1940s, however, the concept of the modern walking safari was pioneered by Norman Carr in Zambia's Luangwa Valley, who wanted to give people an opportunity to experience wildlife in close proximity. Today, the walking safari is considered one of the most authentic and exhilarating ways to explore Africa's national parks and reserves. Devon Meyers has been guiding across Africa for 12 years, and is a passionate advocate of the walking safari. Here he tells us why is should be a must-try experience for every safari guest. "Walking in the wild is the oldest form of safari and the aim is to enjoy nature in a natural, non-threatening way. More to the point, climbing out of a vehicle and stepping down to the same level as lions, elephants and zebra delivers an incredibly intimate insight into the intricacies of the African veldt, not to mention an opportunity to encounter some of country's most exciting wildlife from a unique – and often thrilling, perspective." How does a walking safari differ to a traditional game drive? "Walking safaris and game drives represent two very different types of experience, and I always advise our guests to try out both. Certainly a game drive generally allows guests to get a little more up-close-and-personal with wildlife – albeit from within the confines of a vehicle, and photographic opportunities are sometimes better from a vehicle. On the other hand, while we don't get as close to bigger wildlife on a walking safari, it's a great chance to see other lesser known species including birds and insects – and the experience is definitely a more visceral one." What does a typical day look like on a walking safari? "Walking safaris generally take place in the morning from 7am – 10am, or in the late afternoon from 3pm – 6pm, with a maximum of six guests per group. The distance of the walk will depend on two key factors – the fitness level of the guests, and what we find along the way. Generally, we try and tailor walks to ensure they are at a comfortable pace and distance for specific participants. "Sanctuary Swala is the most remote camp in the Tarangire, which means that the areas our walks cover are not only teaming with wildlife, but are also pretty much devoid of vehicles, which delivers a very natural and authentic experience for our guests. "Every walking safari is different and we're always on the lookout for whatever nature offers us on the day. Sometimes we'll encounter a great sighting within the first hour and spend quite a bit of time following and viewing what we have found. On other days, we might uncover elephant tracks and follow them to find the herd. This sometimes means we cover slightly longer distances, but it's incredibly rewarding for guests when they track down wildlife themselves." "Like any interaction with wild animals, walking safaris have their risks. Before we set off, all our guests are given a comprehensive safety briefing, which covers everything they need to know, from how we'll be communicating along the way, to emergency procedures. For example, we'll often use hand signals or clicking of the fingers or tongue to communicate, as these are more natural sounds and therefore more likely to go unnoticed by the animals. "During a walking safari, guests are accompanied by me and a TANAPA (Tanzania National Parks) Ranger. My role is to lead from the front and guide guests, while the TANAPA Ranger follows the group, and has the very important job of keeping an eye out for wildlife from the rear. Favourite animal to track in the bush? "I really enjoy the tracking and stalking all types of game, but if I had to choose, it would probably be buffalo. In any herd, there are hundreds of eyes, ears and noses, looking, listening and smelling for what may be around them. This makes them a very tricky group of animals to stalk and view without being noticed, and I really enjoy rising to the challenge." Most memorable sighting on a walking safari? "I have been fortunate enough to witness plenty of interesting and memorable sights during walking safaris, including mating black rhinos and lion kills. But watching a group of seven old buffalo bulls chase a pride of lions and force them to take refuge at the top of a tree was one of the most astounding. The lions had to wait until the buffalo had lost interest in them before they were able to come down and make for cover." When is the best time to do a walking safari? 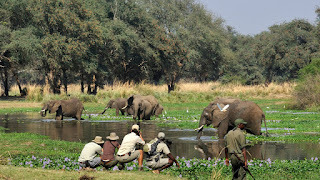 "Walking safaris from mid July until the end of March. Outside of this period the grass is extremely tall, making walking uncomfortable and less safe due to low visibility." "First up, binoculars, binoculars and binoculars! These are important for spotting wildlife and getting a closer look. A decent set of binoculars will significantly enhance any safari experience, whether on foot or in a vehicle. "Comfortable, closed shoes and neutral coloured clothing (such as dark greens, grey and khaki) are also important for comfort – and to make sure guests bend into the environment. "Hats, sunscreen, and sunglasses. Water. And of course, a small camera! 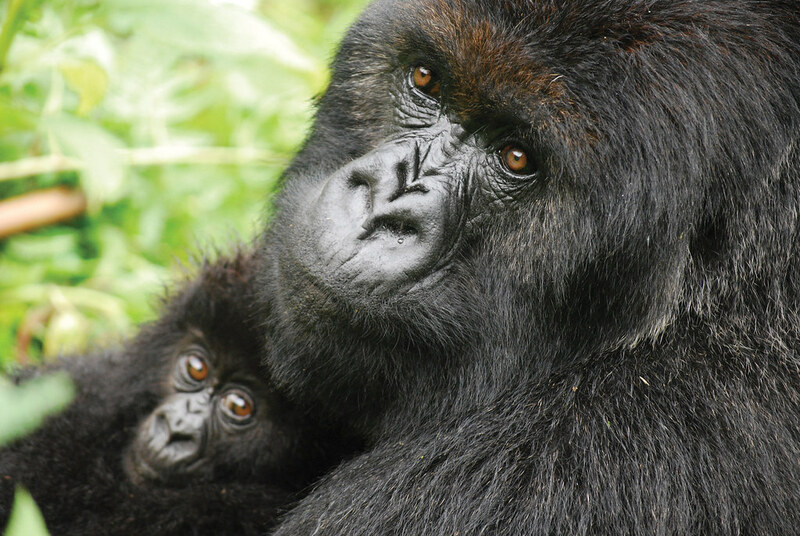 Uganda is best known for its concentration of primates, including its most celebrated residents – half the world’s remaining mountain gorilla population. Gorilla trekking is high on the wish list for many travellers, and Uganda is one of few countries where it is still possible to observe gorillas in the wild. But the recent move by Rwandan authorities earlier this year to implement a significant price hike for compulsory gorilla trekking permits from US$750 to US $1,500 per person for all visitors has added significantly to Uganda’s appeal, with Ugandan permits considerably more affordable at just US$600 per person. One of the best places to see gorillas in Uganda is the Bwindi Impenetrable Forest, a UNESCO World Heritage Site in the country’s southwest. Bwindi is home to just over half the world’s last surviving mountain gorillas, as well as the spectacular Sanctuary Gorilla Forest Camp. Comprising just eight tents, it is one of the most remote and atmospheric camps in Africa. Frequently visited by gorilla families due to its unique location, it is the perfect base for a once in a lifetime encounter with mountain gorillas. We asked Michael McCall, what guests staying at a Forest Camp can expect when embarking on a gorilla trekking trip. “This is where you will be introduced to your guides for the day and receive a safety briefing ahead of the trek. You’ll be one of just eight trekkers, and you’ll be accompanied by a Uganda Wildlife Ranger plus two armed rangers (to fend off any rogue forest elephants). There’s also a porter for each guest, who will be carrying everything you need during the trek, including water and a packed lunch. “Every trek is different, and can last between four and 10 hours, depending on the location of the gorillas. The terrain is varied and may involve climbing up and down some quite mountainous trails. Along the way, your guide will be looking (and listening!) out for clues from the surrounding forest, including scouring the foliage for droppings, left over food and knuckle fingerprints. The aim is to find out where the gorillas have spent the night, as they tend to only travel up to 1km per day and are likely to still be nearby the nest. “Once you’ve located your chosen gorilla family, you’ll have around an hour to observe them in their natural habitat. And of course, the rangers are extremely knowledgeable and will be on hand to answer all your questions and explain gorillas’ behaviour. “While there are certainly restrictions on how close you can get to the gorillas (10M) they can be as curious as you are, so be prepared to say hello! “Once your magical hour has come to an end, it’s time to head back to camp where your drink of choice and a much-welcomed refreshing towel will be waiting to welcome you home. “The laundry team are also on standby to clean boots and clothes for your next adventure. And for those with stiff muscles, a visit to the masseuse in the mini spa for a well-deserved post trek massage is a must. For anyone planning a gorilla trek, here is Michael’s list of essential items you should definitely not leave home – or camp, without! · A good quality waterproof camera. · A poncho or rain jacket as it can rain heavily, even in the dry season. · A walking stick, which will be provided by the Camp. · Gloves which come in useful for grabbing bushes, or sliding downhill on the seat of your pants as you never know where your trek might take you!. · Bug repellent. DEET strength. · A good-quality, solid – and comfy hiking boots. · Cool, comfortable clothing in muted colours. Michael recommends long sleeves, trousers, long socks and gaiters to keep bugs out and prevent scratches.